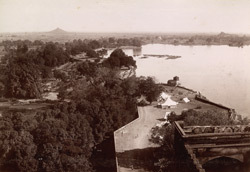 Photograph looking towards the artificial lake from the fort at Barwa Sagar in Uttar Pradesh, taken by Deen Dayal in 1882, from the Lee-Warner Collection: 'Scenes and Sculptures of Central India, Photographed by Lala Deen Diyal, Indore.'. In the North Western Provinces List of 1891 Fuhrer wrote, "To the north-west of the town is a fine old castle on the border of the lake, said to have been built about 130 years ago by Udit Singh, the Bundela Raja of Orchha. The ground floor consists of large vaulted rooms, the large windows of which look out upon a deep precipice near the lake, and a winding staircase leads to the first floor. The rooms at the top are surrounded by a terrace overlooking the lake. There is a wide stone road winding the rock upon which the fort is built, which leads right up to the secondary storey. The lake is the most attractive feature in the landscape."